Did someone say free comics? They did. In fact, they've said it on the first Saturday of May every year since 2002. Joe Field wrote an article in the August 2001 issue of Comics & Game Retailers trade magazine brainstorming about the idea. 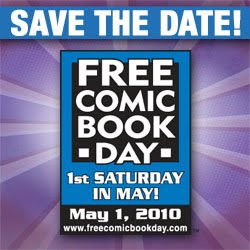 With a little coordination (okay, probably a TON of coordination) by Diamond Comic Distributors, Free Comic Book Day was born. This gets you to your local independent comic book store, and it's also a great way to bring a friend to the world of comics. Distributors sell a selection of comics (usually picked for their broad audience appeal) to sell to retailers for relatively cheap. Retailers work to promote FCBD with special signings or shindigs. The level of promotion definitely plays a part in the success of the event for each store. Over the past six years, thirty countries have participated and retailers all over the world have given away 12 million plus copies of the special edition comics. How many more comic book readers has this mission generated? There's not a definitive answer that I can find, but I bet it's more than a few. Where can you go to get your free comic? Use the handy store locator on the left hand side; type in your zip code, and you'll get a list of participating stores in your area. Some stores will be giving away just one comic, others may be giving away more. If you really must know, call the store ahead of time to see what their FCBD policies are. Check out their websites too. Many shops arrange special signings and other fun events around this very awesome day. This is the list of comics that will be available (again, may vary depending on the store). I'll be hitting a few comic book stores near Burbank, CA. This is my first time taking advantage of FCBD, and I'm looking forward to it and also bringing a friend into the world of comic books. Hey - I would have appreciated someone taking me years ago. I've made a few appearances as Obi-Wan at a few Free Comic book days and it's always fun. Brings people of all ages in to the stores. REALLY bummed that I won't be able to take part in FCBD :( Directing in 16-Hour play project which puts me in a theater from 6:30 a.m.-midnight. Crushed. Had I realized it was during FCBD I may not have committed. Have fun! MonkeyJedi - Oh NO!! That is rotten timing. I will try to have enough fun for both of us.